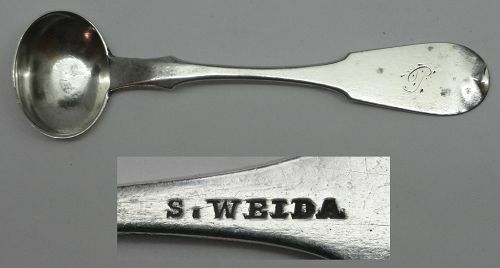 Offered is a scarce example of the mark of Reading, Pennsylvania jeweler Solomon Weida, whose biographical information appears below. This piece is engraved with a period script monogram and has a good clear maker's mark. It measures about 3 3/4 inches in length and weighs about 8 grams. Condition is fairly good, with some surface wear and stubborn tarnish spots, and one small, shallow ding to the bowl. All in all a nice example of this man's wares! According to his obituary, published in the "Allentown Leader" newspaper on July 15, 1909, Mr. Weida was born in 1824 on the farm of his father, John Weida, at Weidasville, in Lehigh County, PA. He learned the jeweler's trade with John Stein of Allentown, and once trained, worked as a journeyman for two years in New York City, and a further two years in Rochester, NY. He then moved to Reading, PA in the spring of 1848 and went into business with George W. Stein, formerly of Allentown, for one year. Thereafter, Mr. Weida went into business on his own, from 1849 until his retirement in 1872. It appears as though he had a nice 37-year retirement!